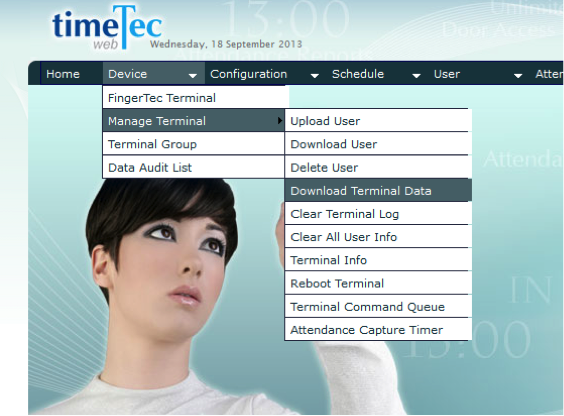 TimeTec Web is a powerful web-based solution for automated time and attendance to suit most businesses, regardless of their size. 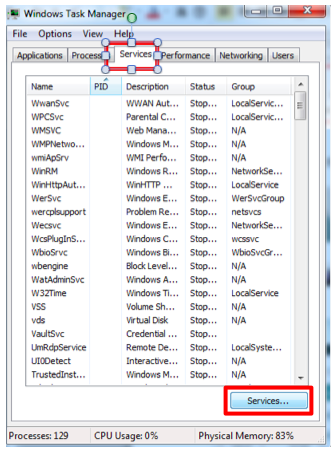 However, much like other powerful applications, some of the settings may seem complicated and cause future issues if they are not configured properly. This can sometimes result in the data not appearing in the Attendance Sheet. Click more to see how to resolve this issue. 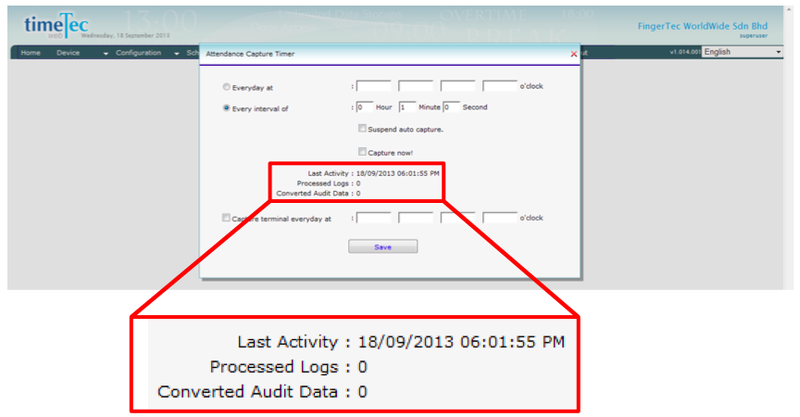 When you find that the data in TimeTec Web does not appear in the attendance sheet, you must first re-confirm whether the data is truly lost or is simply not assigned to the attendance sheet. Do so by going to Menu > Data Audit List. If the data appears here, you may simply press Convert to reassign the data back to your attendance sheet. However, if the data does not appear here (as shown below), you will need to do further diagnosis steps to retrieve the lost data. You will need to re-download the data from the terminal by clicking Devices > Manage Terminal > Download Terminal Data and proceed to re-download the data from all devices. 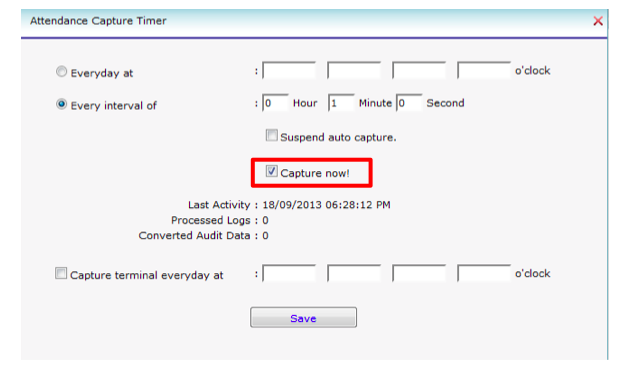 Click Devices > Manage Terminal > Attendance Capture Timer. From here, you will see info on your Last Activity. It should be close to your existing local time. However, if the time shown on the server is too far apart from the local time, it means that TimeTec Web has stopped processing your data since that particular time as shown in the two pictures below. This will require you to proceed to Solution 2. 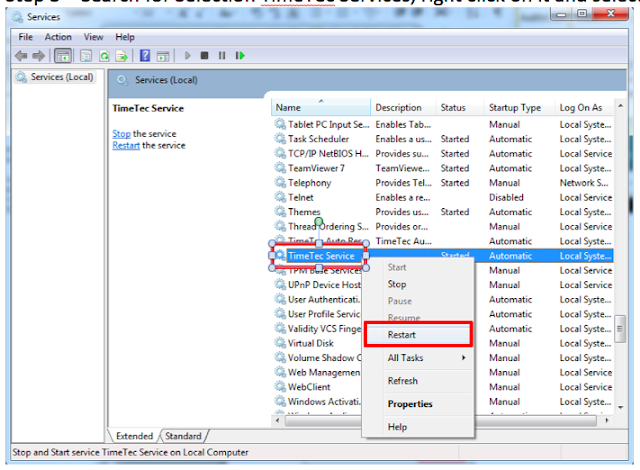 Right-click at the start bar and select Start Task Manager. Click on the Services tab and click the Services button. Search for TimeTec Service, right-click on it and select Restart. After this step, you can check the attendance in your server to see if it is appearing correctly in your Data Audit list. Once it appears correctly, you can install a tool to prevent this error from happening in the future via the following link. May I know you are referring to which software? Whether TCMSv2,TCMSv3,Ingress or TimeTec TA Software?